60″ x 48″ (153 x 122cm) acrylic on canvas 2004. 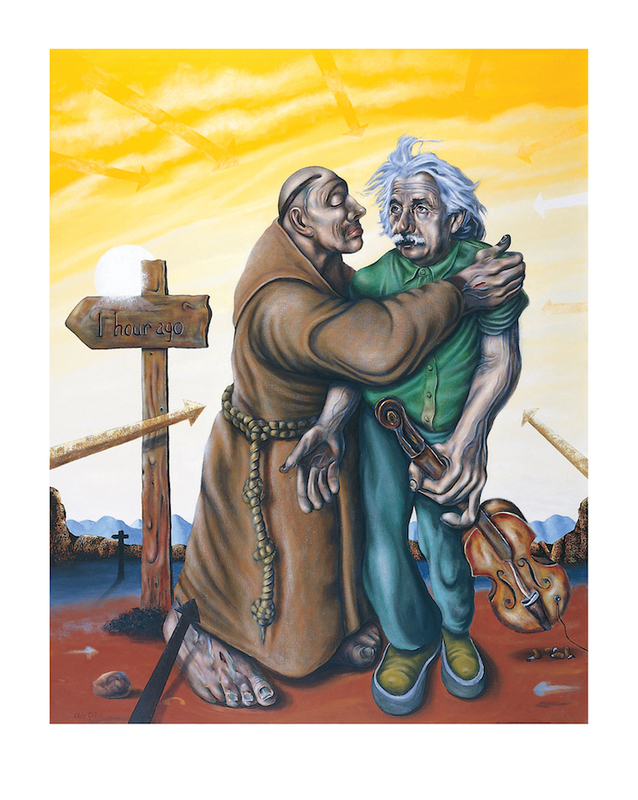 This painting was purchased in 2005 by the Huddersfield Art Gallery for its permanent collection, where it hangs alongside Sir Jacob Epstein’s bust of Einstein and works by Francis Bacon, Henry Moore and Walter Sickert. 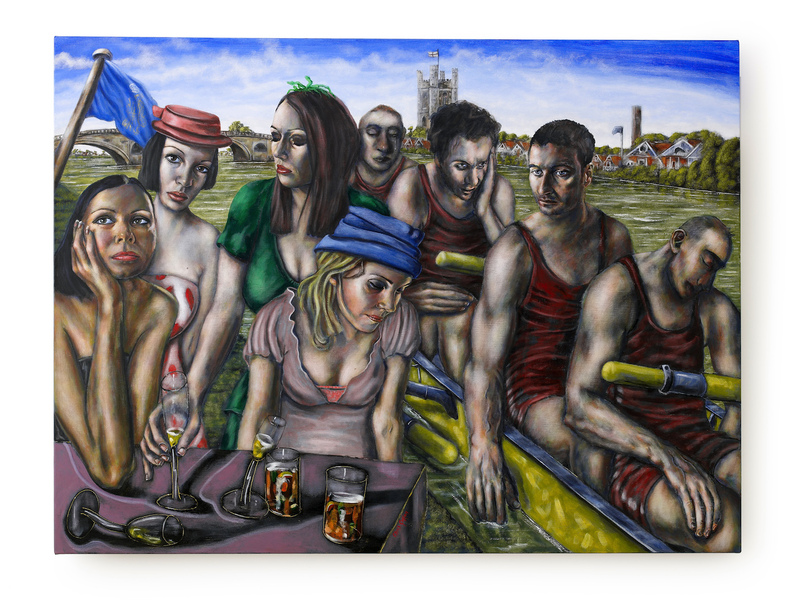 This painting is also featured in art historian Tamsin Pickeral ‘s book Chris Gollon Humanity in Art (Hyde & Hughes, 2010), endorsed by Bill Bryson OBE. 36″ x 48″ acrylic on canvas 2008. Permanent collection, River & Rowing Museum, Henley-on-Thames. In 2007, Chris Gollon was commissioned by the award-winning River & Rowing Museum, Henley-on-Thames, to paint the Henley Royal Regatta. The commission was co-funded by Beefeater Gin and the American Friends of the River & Rowing Museum. Gollon was given a rare ‘Silver Pass’ for the Royal Regatta of the same year, allowing him access to all enclosures, the press box and the finishing line. Gollon took hundreds of photographs and from them made several painting studies and four editions of silk-screen prints. He finally took the decision to paint the anguish of the losing crew, since there are no silver or bronze medals awarded at Henley, therefore after months of training most crews’ experience is that of losing. A series of silk-screen print studies were also made, which may be viewed in Printmaking. 36” x 46” (91 x 117cms) acrylic on canvas 2001. This hinged triptych was co-purchased in 2001 by the Victoria & Albert Museum and the award-winning River & Rowing Museum, Henley-on-Thames. It forms part of the latter’s permanent collection, alongside works by John Piper and Raoul Dufy. “The left panel shows a burbot, an increasingly rare river fish whose diet includes frogs. The centre panel holds a pike eating a brown trout, with lampreys below. Gollon used one of his his ‘close-up’ techniques to great effect in showing the trout’s anguish. In the right panel we see a perch perhaps about to take a fisherman’s bait, and below a zander. Titled by Chris Gollon after one of Breughel’s etchings, the triptych was purchased with the aid of the Victoria & Albert Museum, London, and now hangs in the River & Rowing Museum’s permanent collection alongside works by Raoul Dufy, Julian Trevelyan, John Piper and Justin Mortimer. “The roots for this series can be traced back to 2001, to when Gollon had his studio on Platts Eyot island. As an artist working in such close proximity to the river Thames, his work came to the attention of Paul Mainds, Trustee & Chief Executive of the River & Rowing Museum, at Henley-on-Thames. Mainds invited Gollon to stage a solo exhibition of his work as one of several exhibitions including John Piper (1903-92), reflecting how the Thames had affected their paintings. 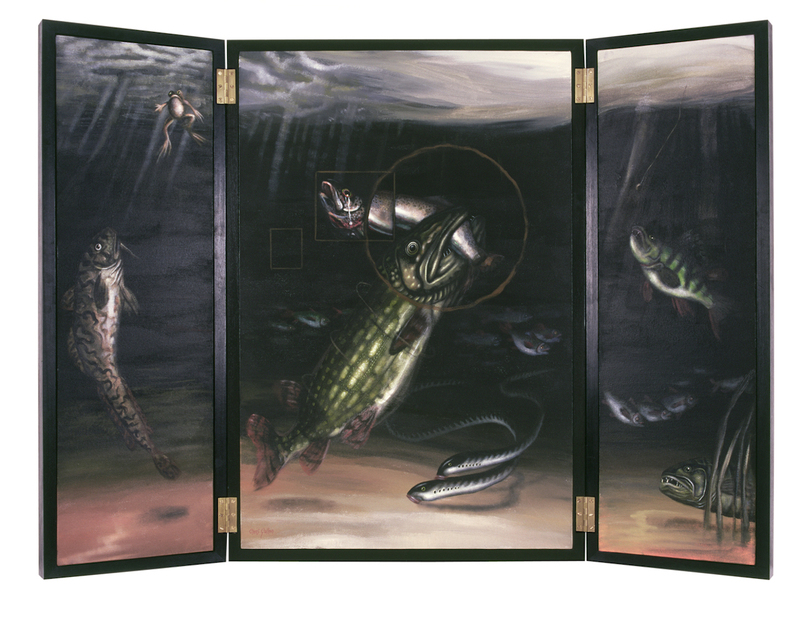 Gollon painted the exquisite Big Fish Eat Little Fish triptych for the exhibition along with a number of smaller studies, all executed with a combination of striking realism and characteristically Gollonesque quirkiness. Text by art historian Tamsin Pickeral from her book Chris Gollon Humanity in Art (Hyde & Hughes, 2010), endorsed by Bill Bryson OBE. 15” x 13” (38 x 33 cms) single-line, hard-ground etching on Arches Creme 300g fine art paper, 2005. Signed edition of 25. An etching from the edition was acquired by the British Museum in 2011 for its permanent collection. The etching was made by Chris Gollon at Limberhurst Press (printmakers Ian & Jan Wilkinson) and published by IAP Fine Art. 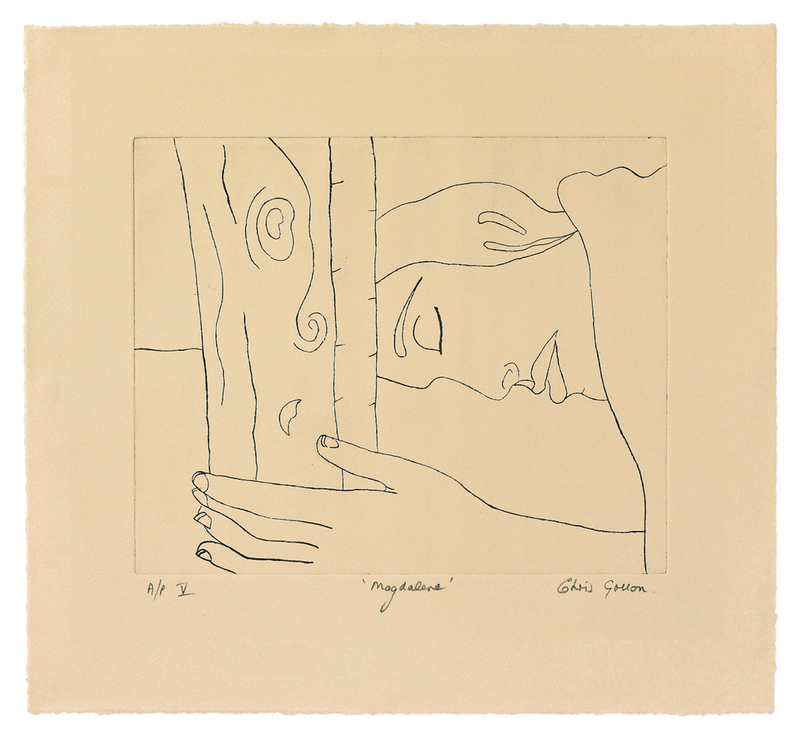 ‘Magdalene’ is a lyrical single-line, hard-ground etching from an edition of 25. This work is also an official study for his epic series of paintings of the Fourteen Stations of the Cross. An etching from the ‘Magdalene’ edition is now part of the British Museum’s permanent collection, and is housed in the Department of Prints and Drawings. Site-specific diptych: each panel 59″ x 20″ (150 x 50cm), acrylic on canvas 2016. Purchased by the grade-one listed Romsey Abbey, Hampshire, and permanently installed. 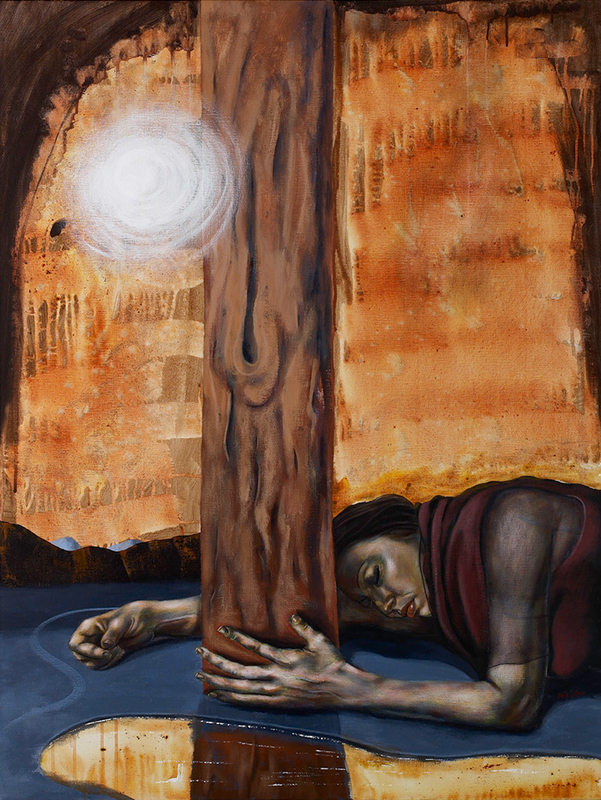 This work shows the legend of the 10th century Abbess St Ethelflaeda, when at the moment when she entered the Abbey a gust of wind blew out her candle, but a Divine light then emanated from her fingers enabling her to carry on her lecture of the Bible. 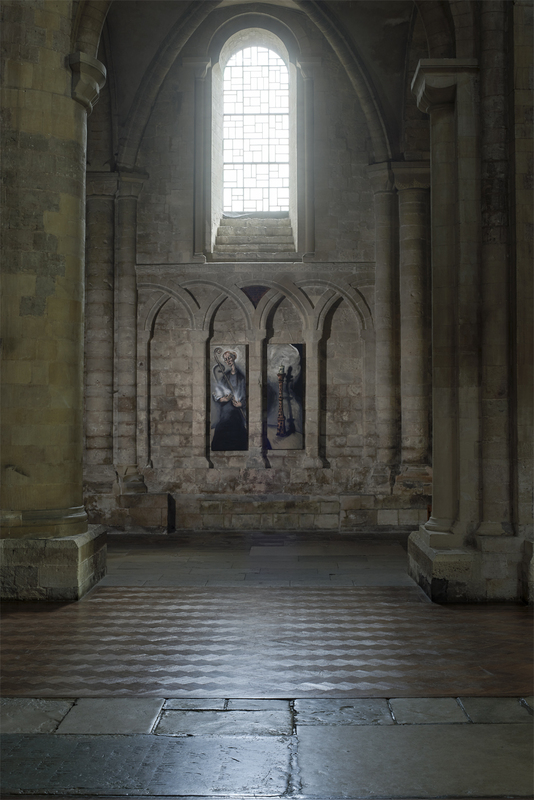 As ‘Incarnation, Mary & Women from the Bible’, Chris Gollon’s national touring exhibition to English Cathedrals, came to Romsey Abbey in October 2016, he was very taken with the various legends of St Ethelflaeda and asked if he might paint her, specifically for an arcade of bare stone niches in the south nave. 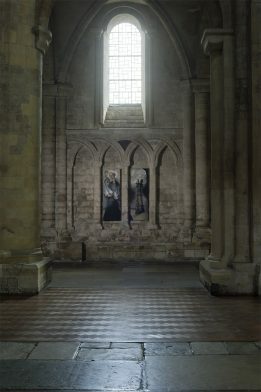 Gollon’s diptych painting seems to create a passageway through which St Ethelflaeda re-enters the Abbey from the nunnery. As it was unveiled, there was a strong feeling among onlookers that her presence was suddenly felt again in the Abbey. The installation in 2018 was accompanied by the publication of an ISBN-numbered fine art catalogue, with texts by leading writers including Sara Maitland. 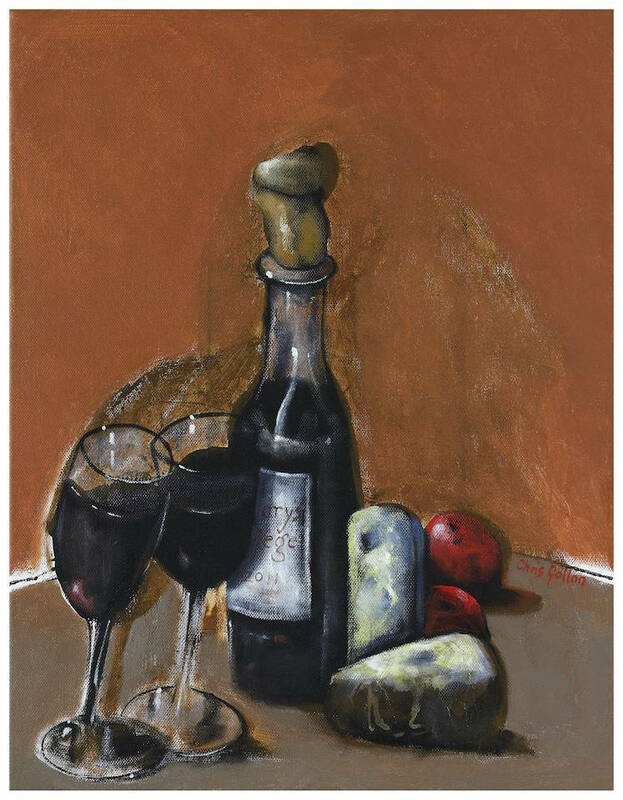 Available from Abbey shop or IAP Fine Art. 48″ x 36″ (122 x 91cm) acrylic on canvas 2009. Permanent collection, Institute of Advanced Study, Durham University. In 2009, Chris Gollon was made a Fellow of the Institute of Advanced Study, Durham University, and invited to be its First Artist In Residence in order that he work with some of the world’s leading thinkers on the Being Human project. In that time he produced a remarkable series of works, and a catalogue was published featuring them and text by the thinkers. For more information and images: Being Human. 36″ x 24″ (91 x 61cm) acrylic on canvas 2008. 48″ x 36″ (122 x 91cm) acrylic on canvas 2009. Permanent collection, Institute of Advanced Study, Durham University. 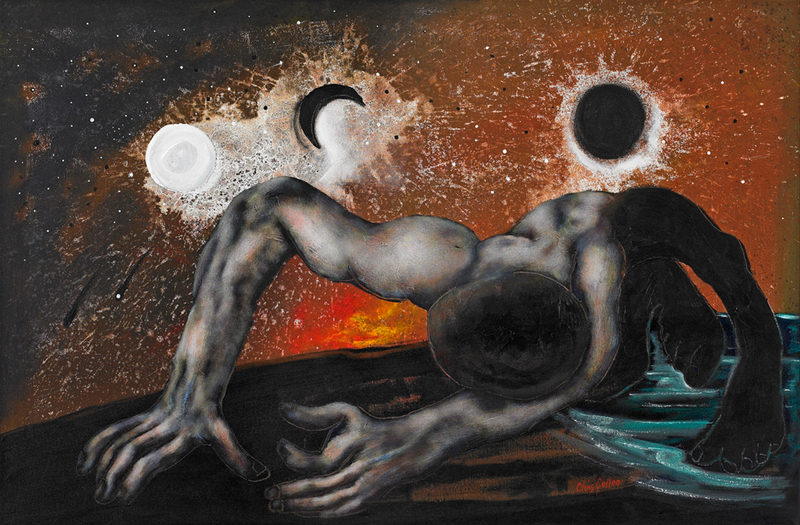 This painting forms part of Gollon’s Early Thoughts series, painted in 2008 in preparation for his time at the institute the following year. In 2009, Chris Gollon was made a Fellow of the Institute of Advanced Study, Durham University, and invited to be its First Artist In Residence in order that he work with some of the world’s leading thinkers on the Being Human project. In that time he produced a remarkable series of works, and a catalogue was published featuring them and text by the thinkers. 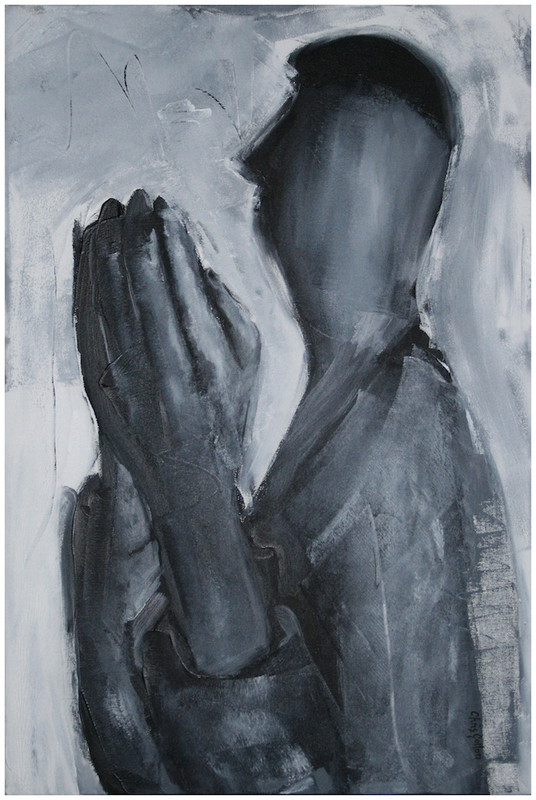 30″ x 20″ (76 x 51cm) acrylic on canvas 2008. St Mary’s College, Durham University. Whilst Chris Gollon was Fellow and First Artist In Residence at the Institute of Advanced Study, Durham University, he was given an appartment to reside in, within the bounds of the University’s beautiful St Mary’s College. He often attended the College’s formal dinners with the Principal and Masters. To thank them and the College for their many kindnesses, he donated this painting to the St Mary’s College collection for students to enjoy. 18″ x 14″ (46 x 35cm) acrylic on canvas 2011. St Mary’s College, Durham University. 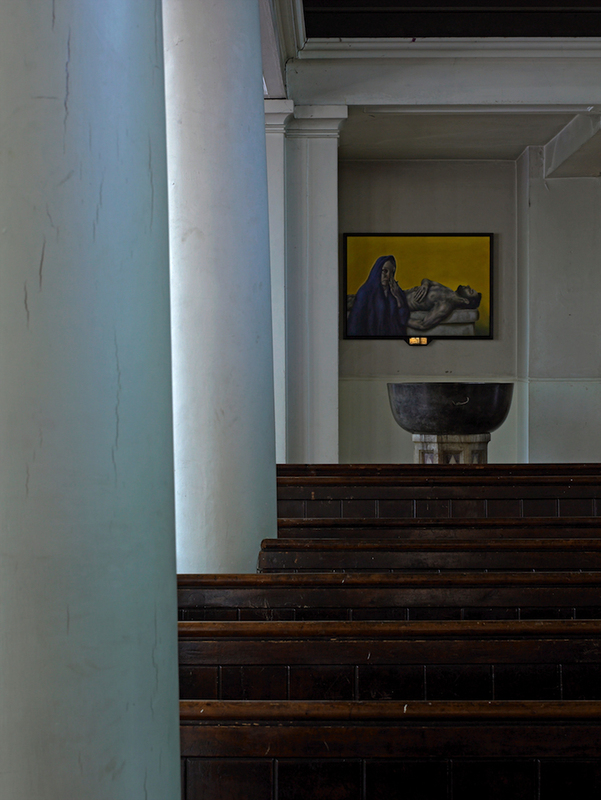 Following the success of Chris Gollon’s time as Fellow and First Artist In Residence at the Institute of Advanced Study, Durham University, in 2009, he was invited to return in 2011, this time as Artist In Residence at St Mary’s College. He was once again given an appartment to reside in, within the bounds of the University’s beautiful St Mary’s College. It was summer terms and he very much enjoyed attending the College’s formal dinners with the Principal and Masters, and also the Summer Ball. To thank the College for their many kindnesses, he donated this painting to the St Mary’s College collection, writing St Mary’s College on the port bottle’s label. Chris Gollon enjoyed many solo museum exhibitions and some major acquisitions, including the British Museum. Critical acclaim is ever-increasing and his work continues to be shown in museums and galleries. His public acquisitions and commissions can also be visited. Click Exhibitions for more details. Chris Gollon’s work continues to be written about and included in books and publications, to find out more visit: Publications. IAP Fine Art holds both the estate of available paintings and the records of collectors and collections who have purchased his work. 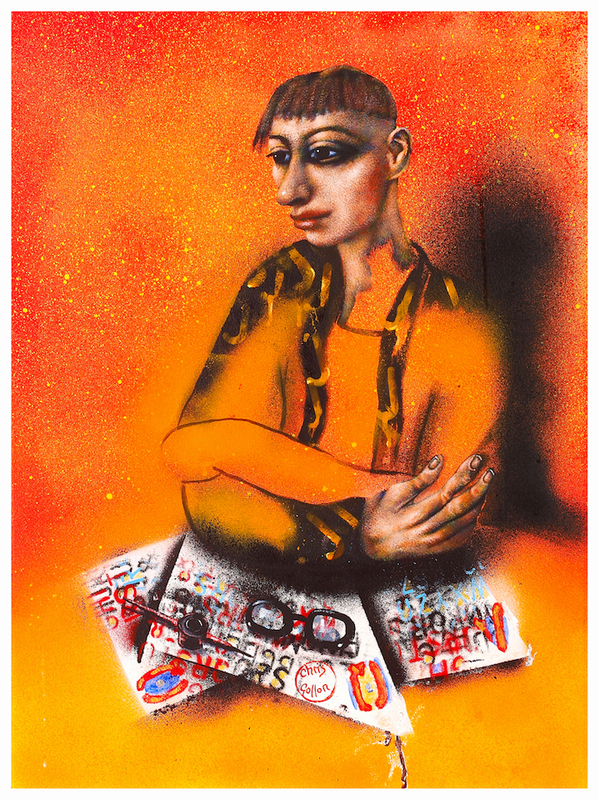 If you are a museum curator wishing to acquire or show Chris Gollon’s work, please contact: IAP Fine Art.